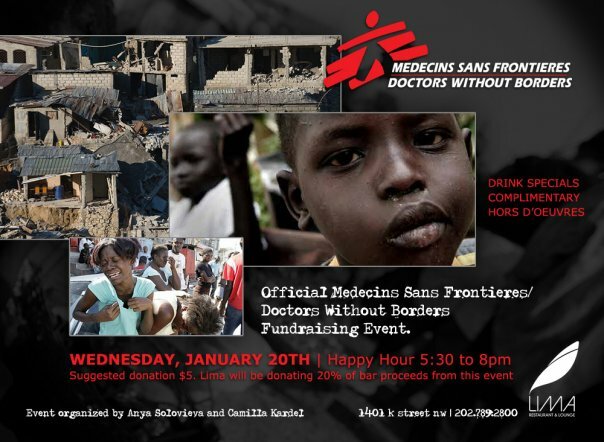 dc: doctors without borders fundraising event. | six words to change the world. ← just six words and a link. dc: doctors without borders fundraising event. When: Wednesday, January 20 from 5:30 to 8:00 p.m.
Why: There will be a suggested donation of $5, and Lima will donate 20% of the night’s proceeds to Doctors Without Borders to help the aid efforts in Haiti. Plus, there will be drink specials and complimentary hors d’oeuvres. Hopefully some of you DC locals can make it. Whether or not you can attend, please continue to send whatever you can (prayers, money, supplies, or otherwise) to the people affected by the earthquake in Haiti.